As we have seen, classifying a religious movement as a sect can be both subjective and somewhat imprecise. What some would call a sect, others might call a denomination. What once had the characteristics of a sect, society now considers to be denomination. The problem is even more challenging when one attempts to use a third classification: the cult. In the academic study of religion cults can be defined as "new movements that appear to represent considerable estrangement from, or indifference to, the older religious traditions; indeed, many do not at all resemble sectarian secession from an older tradition." (Livingston, Anatomy of the Sacred, 4th ed, p. 178). The difference between cults and sects is that cults represent a more radical break with and rejection of the teachings and beliefs of established faith traditions. In contrast, sects are more like offshoots of the major faith tradition. Cults generally arise during times of social turmoil when the established religions seem to become less relevant and more impersonal. They also appear to meet the needs of individuals for spiritual freedom and a direct experience of the sacred. Often cults are an eclectic mix of beliefs, ideas and practices from a number of different religions. A cult is founded by a charismatic leader. Note that the word "charismatic" in this case means someone with a powerful personality who naturally attracts people. A cult usually claims a new revelation or insight from God that alters older religious traditions. Cults are looked upon by the prevailing society and dominant religious community with extreme suspicion. It is this last characteristic of a cult that creates difficulties in using the term to classify a religious movement. The academic study of religion uses both the terms cult and sect as neutral terms. They are not meant to convey a negative judgment or to reject the teaching of these groups. Remember, the phenomenological approach requires the scholar to bracket her/his own convictions in order to understand. Thus, in the academic study of religion cult and sect are merely descriptive terms. For the dominant culture and religious groups, however, the word cult often carries a very negative connotation and is used to indicate groups whose teachings are heretical if not dangerous. The second problem in using the term cult is that scholars do not always agree on whether a group should be classified as a cult or a sect. In other words, the classification of a movement as either a cult or a sect is very subjective. For example, notice that The Sacred Quest suggests that at the time of their origin, the Mormons could be classified as a cult. In contrast, the writers at the Religious Tolerance web site classify the original Mormons as a sect! Moreover, both sources describe how the original movement evolved from a cult or sect into a denomination! Obviously, there is no widespread agreement on how or even whether the terms cult and sect should be used. Consequently, many scholars of religion have abandoned or restricted the use of these terms and prefer to speak of "new religious movements." Sociologist Bryan Wilson has proposed a new means of classifying new religious movements. Wilson abandons the term cult altogether, but uses the term sect to refer to any religious movement of "separated believers." Thus, for Wilson, cults fall under the category of sects. According to Wilson, new religious movements can be understood in terms of how they respond to "the world" or society. Basically, there are four types of responses. 1. Conversionist groups usually do not seek to change the world. Rather they strive to transcend the evil of this world through a conversion experience that is usually highly emotional and very personal. For example the early 20th century saw the emergence of Pentecostal groups that emphasized a personal, emotional spiritual experience, but largely ignored social reforms. 2. Revolutionist movements believe that salvation is imminent, but only after the present order is destroyed. 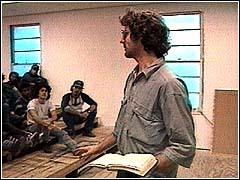 In the United States, a clear example of such a movement is the Branch Davidian community. Read the entry about the Branch Davidians at the University of Virginia Religious Movements Web site. 3. Gnostic or manipulationist groups accept and actively pursue what could be described as worldly goals. The idea is that one can use spiritual techniques to achieve such goals as long life (or even immortality), wealth, success, health and power. Scientology with its emphasis on fulfilling one's potential and freedom from the physical constraints of the material body is an example of such a group. Read the entry about Scientology at the University of Virginia Religious Movements Web Site. Shaker Worship Service 4. The utopia group seeks not to overthrow the existing world, but to reconstruct it according to a divinely given plan. The utopia group always relies upon a communal model for this reconstruction of the present order. Many such groups arose in American in the decades before the Civil War. Each sought to create a new, ideal society purged of evil. One such movement was known as the Shakers. Read the entry about the Shakers at the UVA Web site. More recently, The People's Temple exemplified a utopian movement.